crazybob.org: 802.11n on OS X? Not yet. With dreams of streaming HD video flowing through my head, I spent a good part of the day trying to get my Macs on a draft 802.11n network. See, I want the fastest connection possible between my laptop connected to my TV and my desktop so I can copy video back and forth. Running Ethernet cable isn't an option, and the Ethernet over power line adapters aren't fast enough. That leaves me with 802.11n. 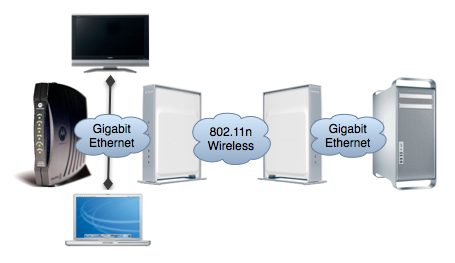 In theory, the router on the right would connect as a client using WDS to the router next to the TV and route traffic to the desktop computer over Gigabit Ethernet, no special drivers necessary. Out of Netgear, Linksys, Buffalo, D-Link, and Belkin, only Buffalo's router supports WDS. To my dismay, Buffalo doesn't offer Gigabit Ethernet. Outside of routing traffic through a Windows machine (or virtual machine) instead of the second router, I'm out of ideas. I guess I'll just have to wait a little longer. I have to admit I'm a little surprised. Wasn't Apple an early adopter of 802.11b and g? Just in case you weren't aware...The new MacBooks/Pros (possibly iMacs) are now coming with 802.11n so they must have some drivers. Anonymous, they have the hardware but, from what I've read, no drivers. Stanley, I'll check out DD-WRT. Thanks for the tip! Bob, macs have had 11n for ages mate, it's built in to the new ones, and you gotta pay like $2 or something stupid to get it "enabled" on the older models due to licensing. Call Apple and find out the details. Dammit! Stupid bloglines.... That's not a new post at all!